COMMITTED: FOR OVER 20 YEARS! 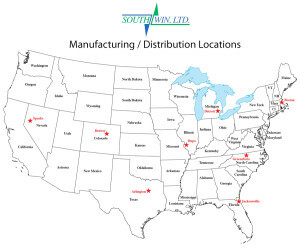 ABOUT SOUTHWIN LTD.Thanks to our customers, over the last 20+ years we have grown to become one of the nation’s top producers of Windshield Wash and RV & Marine Antifreeze products. In order to effectively and efficiently service our growing customer base that encompasses the entire US., we have put together the most powerful manufacturing and distribution network in our industry. State of the art, high speed rotary filling equipment gives us the capability to produce several hundred thousand gallons of our industry’s leading products. We put top quality first… ALWAYS! We are constantly searching for ways to reduce manufacturing materials, use alternative materials, and save energy without compromising product quality. • Blowing our own bottles helps us more effectively respond to customer demand and helps us control manufacturing costs. • We use environmentally sustainable PCR (Post Consumer Resin) in our blow molding operations. • Increases overall carton strength. • Reduces use of corrugated cardboard. • Better for the environment and helps us control manufacturing costs. • Substantially reduced corrugated cardboard usage. • Increased pallet stacking strength. • Reduced damages in transit. With hundreds of thousands of storage square footage and dozens of loading docks, it’s tough to beat our shipping capabilities! Without you there is no need for us. Thank you for over 20 years of partnership!